In mid 2017, Verde Energy Efficiency Experts hired Tacklebox Brand Partners to do a deep dive on our brand strategy. After 7 years of growth through bootstrapping, we finally felt we could afford outside help to make sure our messaging was correct to our customers. The result of this work was a “manifesto”, or a ten page formal document that tells the story of who we are and why we do what we do. The experience overall was incredibly positive, and I learned more about our organization internally than I would have thought possible. We didn’t shop around a lot for a firm, but we did briefly talk to 4 different agencies to get a feel of style and approach. One of the members of our advisory board, Lorraine Herr, had seen David Kelbaugh of Tacklebox speak at an engagement at 1871 in Chicago. She has a marketing background and knew what we were looking for, and felt like they would be a good fit. After working out the price and the expectations of the deliverable, we felt that Tacklebox was the right partner on this journey. Tacklebox met with us and developed a plan of action, which included interviews with both internal employees and external customers. They summarized this qualitative data as a basis for our manifesto and reported back on our findings - from which I found an incredible amount of value. As an owner of a business, one thing I am constantly lacking is unbiased and unfiltered opinions. Here were some highlights they found from their initial customer research. Customers feel that we provide a more accurate communication of the Commonwealth Edison (our local utility) rebates than our competitors. Hard working and reliable, with immense knowledge of the industry to help procure the best money-saving rebates and options possible. Both environmental and affordable. Able to show how being green can be attainable, even for small businesses. Customers felt they could trust and depend on the company and its employees to get the job done, and well. Many positive comments on the work ethic, personality and friendliness of Verde. Hard-working and able to find the greatest savings and options. Approachable and Responsive, which allows some clients to feel compelled to work with Verde due to its professionalism. Earth-friendly and business friendly. Small businesses relate to and appreciate the ways which we work, even though their decision to work with us is often determined by ROI. Great at encouraging a movement away from the past technologies (innovative in our space). Many clients did not find us through internet searches, but rather by word of mouth, ComEd referral, or by our outreach. During our initial growth as a company, we felt that spending our resources on direct customer outreach was better than improving our website or social media. While this was likely the right course at our early stage, at some point we dropped the ball on improving this part of our interaction with our community. The possible savings were usually the most important part of the transaction, not necessarily the greenness. We likely have spent too much time as an organization communicating environmental benefits, whereas the decision is often a financial one. Being associated with ComEd as a trade ally did not deter clients due to their often negative connotation of the monopoly. Historically, we have often tried to steer way from co-branded marketing with the utility, as well as too large of a focus on the name ComEd. However, we were pleasantly surprised to learn that was only a positive relationship to our customers. A larger reach on such platforms helps potential clients come across us naturally. Again, we had historically really steered away from this type of marketing spend in our early days. This feedback showed us it was time to revisit this topic. Tacklebox found there was room to grow into the young, “hip” energy efficiency company. In our field, most of the companies are established contractors and focus on a really professional feel. Lots of polos, big trucks, and clipboards. We have an opportunity to really embrace a different feel - one that we were excited to hear since it fits into our company culture well. They asked for a few competitors in our field that I respected, and then analyzed the marketing information available on those companies to give us some feedback on how others were marketing. I found this type of analysis helpful, especially to learn which competitors I respected didn’t have a great image from a novice customer persepctive. We have decided to make the final Verde manifesto available to everyone, both within and outside of the organization. While it is more of a guide for individual marketing and sales initiatives, as most folks will not take the time to look through a ten page document to learn about your company, it still has value in its completion. The Manifesto does not have value by itself, but how we use it will depend on its success. That being said, just going through this experience did help us really get on the same direction as an organization. The manifesto was described by Tacklebox to be a paint by numbers guide for all of our marketing strategies. It took a while to get the grove of using it, but we have incorporated the look and feel throughout our website, customer documentation, sales tools, and even our internal communications. Even our social media, from our Facebook to our LinkedIn page, has reflective the wording, imagery and core of our new brand story. Do you notice that when you check those out? In 2010, we incorporated as Verde Sustainable Solutions, L3C. However, we have been referred to by a lot of names that are not often our actual legal names. 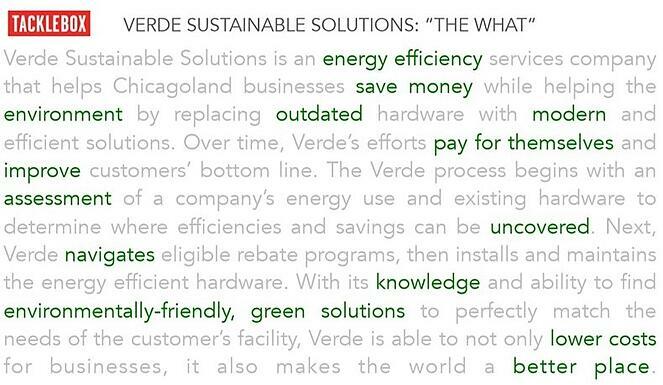 We have recently rebranded to a DBA of Verde Energy Efficiency Experts, as the manifesto process demonstrated this was a better description for who we are. I think this experience helped strengthen who we are - from how we interview and hire new employees, to how we handle customer service. It helped all of us come behind a common message - not what the leadership or manager thinks and feels, but instead, a carefully crafted core of the best takeaway of Verde from our customers and employees. Curious about how we work with our customers to help them save money? Previous Are Smart Power Strips Worth the Money?